Let’s learn how to crochet this gorgeous Asymmetrical Cape-Cho. As you already know, ponchos and capes are the perfect all-weather clothing items. In winter, they add an extra layer of warmth, and in summer, they are light and airy. There are so many designs to choose from and they all make spectacular finished pieces. That’s why we love them and that’s why ponchos and capes are a staple in many wardrobes. 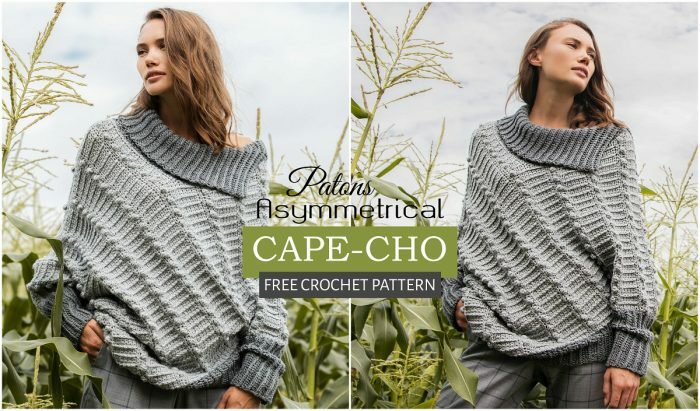 So, today, here at Yarnandhooks, we have put together some of the best tutorials on how to crochet this elegant asymmetrical cape-cho. You’ll just need to follow the free pattern and try to make each and every stitch according to the guidelines. Please, enjoy your crocheting and always feel free to share your experience with us and other crochet lovers. Good luck and happy hooking. This is a great crochet project, with a sweeping asymmetrical design created with bobbles. This Cape-Cho is something truly special and I’m sure you’ll love it. Good luck and happy crocheting.